Citigold’s gold deposit is currently the largest and highest grade in Australia. 11 million ounces of gold (342 tonnes) Inferred Mineral Resource* – JORC compliant. Mineralisation is 25 million tonnes at 14 grams of gold per tonne. Size of the deposit determined after an extensive period of evaluation by the company’s experienced technical team led by eminent consultant geologist Mr Christopher Towsey, in accordance with the Australasian JORC Reporting Code. The report was published in 2012. 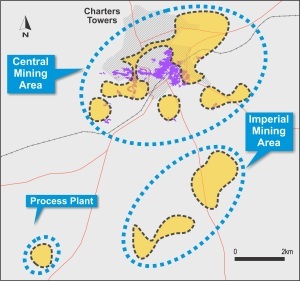 Contained within Citigold’s continuous mineral tenements located at Charters Towers, North Queensland, Australia. Gold grade estimates are based on 1,550 significant drilling samples. Drilling samples at the time, only go to a depth of 1,200 metres, so the entire 11 million ounce resource is above that, with the deposit open below that depth. Independent research indicates that the gold under Charters Towers may continue down to 3,000 metres deep. So the huge area below the drill holes has great potential. In 2008 Citigold, with the financial support of the Queensland Governments Department of Mines and Energy, drilled a very deep 2,000 meter diamond core hole and successfully intersected several reef structures. The deepest intersection was close to 2,000 metres; therefore proving the structures containing the gold mineralisation extend to that depth. Our plan is to build up to a mining rate of 320,000 ozs a year. A mining rate of 500,000 ozs a year would be required to mine the same number of ounces in a 15 year period. Charters Towers gold is hosted in structures with good vertical continuity down to 1,300 metres based on deep drilling and detailed historical mining records. There is good geological continuity of the fractures containing the gold and the economics of mining at Charters Towers reef is well known from the past and current mining. 27 metre-grams of gold per tonne of mineralisation is the average of 272 the significant drill intersections in the mineralised bodies, above at a cut-off of 9 metre-grams of gold per tonne (the average cutoff grade of past mining). 27 metre-grams of gold per tonne of mineralisation is the same as the historical in situ resource grade (based on recovered gold and mining metres). Therefore it is excellent that modern drilling of the materialisation used for the Inferred Mineral Resource matches the historically mined gold grades. Proving the mineralisation is the same. The Resource grade of 14.7 metre-grams of gold per tonne of rock was the average grade from 623 significant drill intersections above 3 metre-grams of gold per tonne. Drill intersections in the central ‘city’ mining area showed a slightly lower grade of 13.5 grams of gold per tonne of rock. Based on extensive past mining over a large area it is known that the ‘pay-ability’ of the structures averages 30% and therefore in calculating the ‘pay-ability’ or high grade part of the mineralised bodies.